Background: The provisory crown is elements essentials to the oral prosthodontics rehabilitation. The requirement to a better aesthetic and strength made the odontologic industry to develop new materials and new methods for making provisory crowns. As well as new materials has emerged in an attempt to increase the strength and aesthetic and reducing the clinical time. The CAD/CAM system (solution chair side), brought the advantage of faster and comfort to the patient associated with better marginal adaptation. The different methods of making these provisory crowns are efficient however there are few studies showing the clinical quality of these materials mainly related to fractures and durability with use over time. Aim: This study evaluated the flexural strength, after the specimen’s thermo cycling of three materials for making provisory crowns. Materials and methods: It was made 60 specimens measuring 25 x 2 x 2 mm, which were milled CAD/CAM system, the resins used were resin PMMA blocks, resin bis-acryl and resin heat polymerized. All specimens were thermo cycling and half were immersed in acid beverage for 24 hours, then washed and stored for 60 days before being taken to the mechanical test of flexural strength. Results: A flexural strength was significantly influenced by the material used (p<0.001). Conclusion: According to Tukey test it was found that, regardless of being performed or not immersion in acid beverage immersion, the resin CAD/CAM VIPI PMMA blocks provided the highest flexural strength values being followed by the resin acrylic heat-polymerized VIPI that in turn was statistically superior to resin bis-acrylic Protemp 4. The successful outcome of an oral prosthetic rehabilitation is in the proper planning techniques and materials to be use. Provisional restorations are key elements for prosthetic rehabilitation treatment. In order to accomplish the provisional restorations are prior planning and use of commercial materials that adequately simulate this therapeutic process are needed, enabling function, esthetics and phonetics in a given period of time. These types of restorations should maintain pulpal protection, positional stability, occlusal function, strength, and aesthetics . Provisional restorations are used for diagnostic aids when correcting irregular occlusal planes, altering vertical dimension, or planning for changes in the location and contour of the gingival or the size, shape and color of the final restorations . The provisional word means momentarily, therefore, the provisional restorations are commonly used for an interim period, they may remain for a few days or even months depending on the planning, and it is responsible for the protection of the pulp and periodontal until the final restoration is installed. The temporary restorations should have marginal integrity, esthetics and sufficient durability to withstand the forces of mastication . Regarding the protection of the complex dentin-pulp the materials should prevent temperature changes resulting from ingested food are transmitted to the tooth. They should keep a flow that is able to copy even the sub gingival margins and it should also take it consideration some element of aesthetic value for the patient . The rehabilitation of partially edentulous patients using fixed partial denture is a well-established for treatment protocol since decades. The temporary phase may provide a future prosthesis prediction . Maintain the vertical dimension stable as well as interin restauration well adapted are important items in this stage of treatment . Temporary materials have changed immensely since their early days in the 1930s- from acrylics and premade crown forms to newer bis-acryl materials and computer-aided design/computer-aided manufacturing (CAD/CAM)-generated restorations . Materials used in the fabrication of interim crowns are generally characterized as either methacrylate or bis-GMA based . Computer aided design/manufacturing (CAD/CAM) technologies have gained popularity in recent years for fixed restorative and prosthodontics treatment procedures,  moreover, these interim prostheses have better properties than conventional materials and may be more suitable for long-term and long-span interim treatments . The problems of using resin materials for provisional prostheses have been identified in the literature. Difficulties may be expected with more extensive provisional restorations that must be used for longer periods of time. There is a tendency for discoloration, occlusal wear, and fracture that eventually leads to unnecessary repair. Heat-processed and reinforced methacrylatebased resins have been used to improve the mechanical and physical properties of provisional restorations . However, the aim of this study was to evaluate and analyse the flexural strength of three acrylic resins used for fabrication of provisional crowns submitted to fatigue term cycling and soaked in citrus drink. The materials used in this study and their characteristics are described in Table 1. Initially it was made a nylon mold measuring 98 mm in diameter by 10 mm high, and these measures are similar to the ones of the prefabricated resin blocks for fabricating crowns interim by the CAD/CAM system. To make the polymerized resin block it was used 56.5 grams of resin (powder) VIPICOR for 19 ml monomer (liquid) VIPICOR handled as manufacturer's instructions and polymerized hydro pneumatic electrical polymerizing for 30 minutes at 100°C with 60 pounds pressure. The bis-acryl resin block was made with 2 Protemp 4 cartridges used with the pistole and tip auto mixer blue (55 mm size), both dispensed on the nylon mold by four hands, that is, by two operators at the same time. After obtaining the blocks of three materials to be tested, the specimens standards were made in CAD/CAM system with rectangular shape measuring 25 × 2 × 2 mm designed by CAD/CAM Solid Works (Wieland Dental, Pforzheim, Germany) and milled (MINI Wieland, Wieland Dental, Pforzheim, Germany) using drills numbers 2.5 and 1.0 mm. Each group consisted of 20 specimens. The size of the specimens and the sample size followed the methodology proposed by previous studies [8-11]. 1. Group A: 20 samples of VIPIBLOCK-metacrylate resin for CAD/CAM. 2. Group B: 20 samples of metacrylate resin heat polymerized VIPICOR. 3. Group C: 20 samples of Bis-acryl resin Protemp 4. Each sample group received the numbering from 1 to 20. The specimens were subjected to thermal cycling, 5°C and 55°C, 30 second each, to complete 5000 cycles that lasted 92 hours or four days to complete the cycle. This thermal cycling promoted an aging material corresponding to six months of use in the mouth. After thermal cycling, specimens of each group were divided into two subgroups of 10 specimens each, randomized. Group 1 was stored at 37°C and group 2 was immersed in acid drinks - cola-based soft drink (Coca-Cola ®) for 24 hours to verify the material degradation by acid components. 1. Group A1: 10 samples that did not undergo immersion. 2. Group A2: 10 samples suffered immersion in refrigerant cola. 3. Group B1: 10 samples that did not undergo immersion. 5. Group C1: 10 samples that did not undergo immersion. After immersion the specimens were subjected to a flexural three-point bending test with a universal testing machine with a 50 kg compression load cell at a crosshead speed of 0.5 mm/min until the fracture of the sample (Figures 1-4). Figure 1: Illustrative image of the resin block PMMA- TRILUX. Figure 2: Nylon matrix for CAD/CAM making blocks. 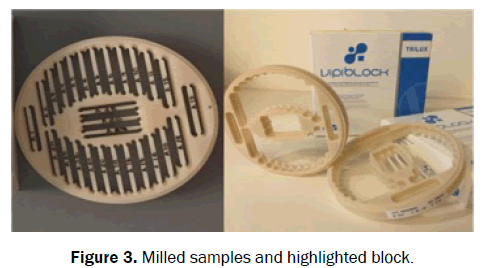 Figure 3: Milled samples and highlighted block. Figure 4: Immersion of the specimens in acid beverage (Coca-Cola®) for 24 hours. Prior to the analysis, the flexural strength data were assessed for compliance with the assumptions of normality (Shapiro-Wilk test) and homogeneity of variance (Levene test) and subjected to analysis of variance with two criteria. For multiple comparisons Tukey's test was applied. Statistical calculations were conducted adopting the significance level of 5% in SPSS 20 (SPSS Inc., Chicago, IL, USA). Table 1 summarizes the mean values and standard deviation of the flexural strength of materials for making crowns, after performing or not soaking in acid beverage. Given that the results for the CAD/CAM VIPIBLOCK material does not adhere to the normal distribution and we identified two extreme discrepant results, it was decided to exclude these samples. With this, all results sets began to show normality. The analysis of variance with two criteria showed no significant interaction between the materials for making temporary crowns and soaking in acid beverage (p=0.084, with 87.0% test power). The flexural strength was significantly influenced by the material used (p<0.001). By Tukey’s test it was found that, regardless whether the immersion in acid beverage was done or not, the CAD-CAM VIPIBLOCK materials provided the highest flexural strength values, followed by acrylic resin polymerized VIPICOR, which in turn was statistically higher than the bis-acrylic resin Protemp 4. This showed resistance 88% lower than that obtained with the CAD-CAM VIPIBLOCK materials (Table 1 and Figure 5). Figure 5: Diagram columns of flexural strength values of materials for making crowns, immersed or not in acid drink. For any of provisional materials the flexural strength was significantly affected by immersion in acid beverage (p=0.115), (Table 1 and Figure 5). Because the p-value interaction was 0.084, approaching 0.05, it may suggest a trend of Protemp 4 bisacrylic resin having a flexural strength adversely affected by immersion in acid beverage. The flexural strength is the ability of a material to resist deformation under load or, more precisely, the higher voltage experienced within the material at its moment of rupture . The best method to reduce the likelihood of fracture is to select an appropriate material based on its behavior in the oral environment when subjected to aging, fatigue, water absorption and wear. However, it is important to know the flexural strength of the various materials for provisional restorations considering the fragility of the same [13,14]. The results of this study showed that, in both methods with and without immersion in acid beverage, the methyl-methacrylate resins were more resistant than the resin bis-acryl by resistance testing flexural three points, which is consistent with the studies of other authors [5,7,10,15-20]. Patras et al. reported that although there are conflicts in literature, it is generally accepted that PMMAs resins have stronger resistance to fracture than bisphenol A resins glycidyl methacrylate (Bis GMA). In this study, the group 1 was stored at 37°C and group 2 was immersed in acid beverage-cola-based soft drink (Coca-Cola ®) for 24 hours, in order to verify the material degradation by acid components. In a study by Akova et al. , the biggest change in hardness of the composite resin after conditioning in acid solutions it occurred within the first 7 days. According to the authors this period was unusually long, since the provisional come into contact with food and beverages only during the eating and drinking. Previous studies showed that polymerization under pressure and heat provides an improvement in the density and enables a higher degree of polymerization, resulting in free resin monomers and internal voids [12,17,22-24]. The resin blocks CAD/CAM are manufactured industrially and polymerized under ideal conditions, which provide to these temporary materials better mechanical properties compared to those produced manually . This difference can be attributed to the fact that the resin blocks for CAD/CAM are made under pressure eliminating possible air bubbles and porosity that may signify an increase in the temporary restoration resistance. According to Yao et al. , methyl methacrylate resin blocks are prefabricated and comprise a long chain linear molecules with minimal intermolecular cross-linking, having a high resistance; besides being machined in extraoral environment, which avoids discomfort pulp, polymerization shrinkage and free radicals. The temporary materials may present chemical variation compositions which allow differences in flexural strength and hence the mechanical properties . The present study found differences between the methacrylate resins, wherein the resin blocks for CAD-CAM VIPI showed significantly greater resistance to flexural VIPI heat polymerized resin. Temporary materials are available based on methacrylates (methyl, ethyl, vinyl and methyletylmethacrylate) and the bis-acryl or Bis-GMA. Since the clinical introduction of these resins, research has focused on improving the formulations in order to increase the resistance. For Wang et al. neither resin proved to be superior to the other in all physical properties, however Gegauff and Pryor  reported that the compounds of bis-acryl resins represent a new class of provisional materials, one intermediate material in relation to the fracture. For Young et al. , the metacrylate resins have satisfactory physical properties including marginal finishing, and polishing force transmission potential, however, exhibit exothermic reaction pulpal irritation and obtaining the mixture may be different from professional to professional. And Karaokutan et al. found in his research that the CAD/CAM can increase the resistance of the provisional restorations, which in fact, was found in this in vitro study. The manufacturer determines the amounts of inorganic filler particles of each material, these being a factor of direct influences on the resistance Haselton et al. . These considerations may explain the difference found between the resins used in this study after thermocycling. According Kawano et al. , resins with inorganic particles when thermocycled become more fragile and susceptible to fracture, contrary to the results of this study demonstrated that the best results methacrylate resins. In this study, the thermal cycling test was used to partially assess the degradation of materials, and all the resins evaluated were found to have a flexural strength significantly influenced by this process. 5000 cycles were applied, and this number is equivalent to, as Karaokutan et al. , approximately 6 months of clinical use. Several authors such as Kawano et al. ; Ehrenberg et al. ; Balkenhol et al. ; Thompson et al. . Lee and Lee ; Peñate et al. report that the thermal cycling seriously influences the mechanical properties of the resins tested. According to Kawano et al. this influence is given to the 5000 cycles, after this, the materials showed a significant decrease in flexural strength between 31 and 41%. According to Nejatidanesh et al. ; Geerts et al. ; materials for bis-acrylic resin provisional exhibited higher flexural strength than materials of methacrylate-based but, according to Nejatidanesh et al. the specimens were subjected to 2500 cycles of thermal cycling, and according to Geerts et al. have not been thermocycling, which may explain the difference in the degradation of the materials compared in this study. Some authors [6,17,24,30,34] affirmed that the time elapsed after polymerization and installation of temporary into the mouth plays an important role in determining the improved properties with respect to the fracture of the temporary materials. According to the authors, the free radical polymerization continues after the initial glassy phase, resulting in a higher connection density formed chain. Due to this fact, the present study it was expected 30 days to occur post glassy phase polymerization of VIPICOR resins and bis-acryl resin Protemp 4 before being carried out the tests, as shown in study of Ireland et al. that the specimens stored for 24 hours, 30 days and 60 days after polymerization before testing. Lang et al. reported that after long periods, all materials with Bis-GMA absorb water, and that these monomers have high resistance to fracture associated with low flexural strength, resulting in brittleness under application of load, which is consistent with the results presented in this study. When required the preparation of provisional restorations to the direct technique Ramkumar et al. , recommend using the bis-acryl resin due to exothermic reaction, less shrinkage and better marginal fit compared to other materials. As stated by Yap et al. , Gujjari et al. and Yanikoglu et al. despite the bis-acryl resins provide softer physical properties of the methacrylate resins, they showed high resistance in simulating the degradative effects of diet, which completely contradicts this study, wherein the methacrylate resin not influenced by acid beverage and bis-acryl resin suggested little influence. The advantages of using CAD/CAM technology for the production of temporary crowns and permanent prostheses can be summarized as: 1) application of new materials; 2) reduced working time; 3) cost-effectiveness and 4) quality control . Nevertheless, the flexural strength of the temporary material is critical, especially in situations where the patient needs to use the temporary restoration for a prolonged period of time and in the presence of para-functional habits . Provisional crowns CAD/CAM are more suitable for long-term treatments [8,39]. Materials for provisional in CAD/CAM system are more stable not only demonstrating greater marginal adaptation but also resisting, heating, cold, and oral fluids. Based on the methodology used in this study to verify flexural strength, it was found that the resins methylmetacrylate blocks for CAD /CAM system are more resistant than methylmetacrylate resins heat polymerized, that in return are more resistant than the resins bis-acryl. Viswambaran CM, et al. An evaluation of fracture resistance of interim fixed partial denture fabricated using polymethylmethacrylate and reinforced by diferent fibres for its optimal placement: an in vitro study. MJAFI. 2011;67:343-347. Yap AUJ, et al. Influence of dietary simulating solvents on the hardness of provisional restorative materials. Dental Mat. 2004;20:370-376. Kamble VD and ParkhedkarRD. In vitro comparative evaluation of the effect of two different fibre reinforcements on the fracture toughness of provisional restorative resins. Indian J Den Res 2012;23:140-144. Perry RD and Magnuson B. Provisional materials: Key components of interim fixed restorations. AEGIS. 2012;33:59-62. Hernandez EP, et al. Mechanical properties of four methylmethacrylate-based resins for provisional fixed restorations. Bio-Med Mat and Engin. 2004;14:107-122. Knobloch LA, et al. Relative fracture toughness of bis-acryl interim resin materials. J Prosthet Dent. 2011;106:118-125. Alt V, et al. Fracture strength of temporary fixed partial dentures: CAD-CAM versus directly fabricated restorations. Dental Materials. 2011;27:339-347. Yao J, et al. Comparison of the flexural strength and marginal accuracy of traditional and CAD/CAM interim materials before and after termal cycling. J Prosthet Dent. 2014;112:649-657. Yanikoglu ND, et al. Flexural strength of temporary restorative materials stored in diferente solutions. J Stomat. 2014;4:291-298. Poonacha V, et al. In vitro comparison of flexural strenght and elastic modulus of three provisional crown materials used in fixed prosthodontics. J ClinExp Dent. 2013;5:e212-217. Haselton DR, et al. Flexural strength of provisional crown and fixed partial denture resins. J Prosthet Dent. 2002;87:225-228. Mei ML, et al. Effect of heat treatment on the Physical Properties of Provisional Crowns during Polymerization: An in vitro study. Materials. 2015;8:1766-1777. Patras M, et al. Management of provisional restorations deficiencies: A literatura Review. J Esthetic and Rest Dent. 2012;24:26-38. Strassler HE and Lowe RA. Chairsideresin- based provisional restorative materials for fixed prosthodontics. Compedium. 2011;32:10-20. Koumjian JH and Nimmo A. Evaluation of fracture resistance of resins used for provisional restorations. J Prosthet Dent. 1990;64:654-658. Osman YI and Owen CP. Flexural strength of provisional restorative materials. J Prosthet Dent. 1993;70:94-96. Ireland MF, et al. In vitro mechanical property comparison of four resins used for fabrication of provisional fixed restorations. J Prosthet Dent. 1998;80:158-162. Jo LJ, et al. Flexural strength and hardness of resins for interim fixed partial dentures. Indian J Dent Res. 2011;22:71-76. Peñate L, et al. Comparative study of interim materials for direct fixed dental prostheses and their fabrication with CAD-CAM technique. J Prosthet Dent. 2015;114:248-253. Rayyan MM, et al. Comparison of interim restorations fabricated by CAD-CAM with those fabricated manually. J Prosthet Dent. 2015;114:414-419. Akova T, et al. Effect of food-simulating liquids on the mechanical properties of provisional restorative materials. Dental Materials. 2006;22:1130-1134. Ehrenberg D, et al. Long-term effects of storage and termal cycling on the marginal adaptation of provisional resin crowns: A pilot study. J Prosthet Dent. 2006;95:230-236. Diaz-Arnold AM, et al. Microhardness of provisional fixed prosthodontic materials. J Prosthet Dent. 1999;82:525-528. Thompson GA and Luo Q. Contribution of postpolymerization conditioning and storage environments to the mechanical properties of three interim restorative materials. J Prosthet Dent. 2014;112:638-648. Karaokutan I, et al. In vitro study of fracture strength of provisional crown materials. J AdvProsthod. 2015;7:27-31. Wang RL, et al. A comparison of resins for fabricatin provisional fixed restorations. Int J Prosthod. 1989;2:173-184. Gegauff AG and Pryor HG. Fracture toughness of provisional resins for fixed prosthodontics. J Prosthet Dent. 1987;58:24-29. Young HM, et al. Comparative in vitro of two provisional restorative materials. J Prosthet Dent. 2001;85:129-132. Kawano F, et al. Influence of thermal cycles in water on flexural strength of laboratory-processed composite resin. J Oral Rehabilit. 2001;28:703-707. Balkenhol M, et al. Mechanical properties of provisional crown and bridge materials: Chemical-curing versus dual-curing systems. J Dent. 2008;36:15-20. Lee J and Lee S. Evaluation of add-on methods for bis-acryl composite resin interim restorations. J Prosthet Dent. 2015;114:594-601. Nejatidanesh F, et al. Flexural Strength of Interim Resin Materials for Fixed Prosthodontics. J Prosthod. 2009;18:507-511. Geerts GAVM, et al. The effect of diferente reinforcements on the fracture toughness of materials for interim restorations. J Prosthet Dent. 2008;99:461-467. Kerby RE, et al. Mechanical properties of urethane and bis-acryl interim resin materials. J Prosthet Dent. 2013;110:22-28. Lang R, et al. Fracture resistance of PMMA e resin matrix composite-based interim FDP materials. Int J Prosthod. 2003;16:381-384. Ramkumar V, et al. Effect of water temperature on the fit of provisional crown margins during polymerization: An vitro study. J Pharm Bioall Sci. 2012;4:376-383. Gujjari AK, et al. Color stability and flexural strength of poly (methyl methacrylate) and bis-acrylic composite based provisional crown and bridge auto-polymerizing resins exposed to beverages and fodd dye: An in vitro study. Indian J Dent Res. 2013;24:172-177. Miyazaki T, et al. A review of dental CAD/CAM: current status and future perspectives from 20 years of experience. Dental Materials J. 2009;28:44-56. Stawarczyk B, et al. Two-body wear rate of CAD/CAM resin blocks and their enamel antagonists. J Prosthet Dent. 2013;109:325-332.